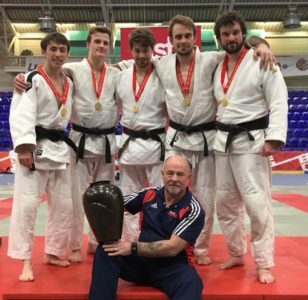 This weekend saw the Oxford Men’s Team win the 2018 BUCS National Judo Championships in Sheffield. Oxford last won the championships 18 years ago, in 2000, and despite having come very close since with some silvers and bronzes, this celebrates the strength, grit and determination of the men’s team against some very strong opposition. The winning team was formed of lightweight James Fowler, middleweights Alex Hampshire, Gregor Cremosnik and Vidar Skretting (captain), heavyweight, Matthew Edmans, and head coach, Chris Doherty. With Alex Bridge, Sam Garforth and Sam Acreman forming reserves for the team. The Oxford team started in an initial pool of four with Durham, Manchester and last year’s champions, Wolverhampton. The team got off to a strong start, winning all five fights against Manchester, beating Durham 4:1 and Wolverhampton 3:2. Finishing first in the pool, they progressed through to the quarterfinals to face Loughborough. Highlights of this match included a 30 second win by Alex Hampshire, and a sub 45 second wins from Gregor Cremosnik and Matthew Edmans. In the semi-finals they faced last years bronze medalist’s and performance centre, Bath. Oxford pulled off an incredible 5:0 win, with Captain Vidar Skretting arm-locking his opponent into defeat within 22 seconds. In the final they faced Anglia Ruskin. This brought back some bitter-sweet memories for the Oxford team from when they last reached the BUCS finals in 2016, and suffered a narrow 2:3 defect to the exact same team. With many of the same players still on both teams, this was bound to be a tense match. The first two fights were won by James Fowler and Alex Hampshire, giving Oxford a 2:0 lead. Vidar Skretting secured the final win for the team, giving Oxford the 3:2 victory they needed to secure the gold. Oxford has performed very well in the team championships for the last three years, with the Men’s team winning silver in 2016, and the Women’s team winning silver in 2017. Oxford also produces numerous medalists’ in the individual championships. 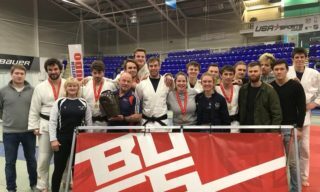 The BUCS National Individual Championships is on the day prior to the team tournament, and this year James Fowler was crowned u60kg BUCS National Champion, Vidar Skretting took silver in the u90kg bracket, and Matthew Edmans took bronze in the u100kg bracket. Sam Richie also came away with a bronze in the +100kg bracket, and Sanna Djurhuus, a gold in the +78kg (blue belt and below) category. Stellar performances all round from our other players, with Nick Humphries taking 5th in u66kg kyu grades, and good fighting and wins from Danil, Zhan, Stanislaw, Pawel and president Ella. Finalists of the individual Dan grade brackets get to represent Great Britain at the European University Championships, so good luck James and Vidar, go win us some more bling! Want to see the team go shoe the tabs? Come support us at the Varsity match, this Saturday (24th February), held in Magdalen College School, with fights starting at 11.30 am. Oxford will front a city team, women’s blues team, men’s blues team and men’s B team to face Cambridge in what is bound to be an exciting match. To get an idea of what to expect, and see the teams in action, check out our highlights clip from the previous year here.